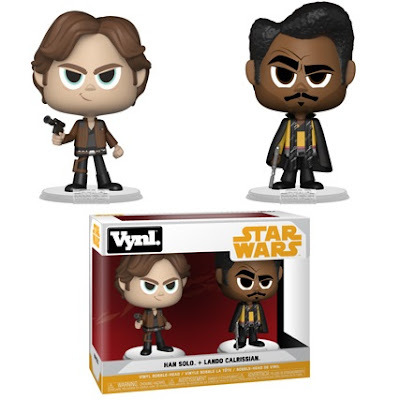 Funko has announced its expanding its popular line of Solo: A Star Wars Story collectible vinyl figures with a Solo Vynl Vinyl Figure 2 Pack featuring Han Solo and Lando Calrissian! Now fans everywhere can recreate that moment when the galaxy’s most famous smuggler and rebel pilot walk into an establishment for a friendly game of sabacc and arguably the most famous starship in any galaxy changes hands. Funko brings together both owners of the iconic Millennium Falcon, not to mention the galaxy’s coolest frenemies, in this fantastic Solo: A Star Wars Story Vynl Box Set. Each vinyl figure in the Solo: A Star Wars Story Han Solo and Lando Calrissian Vynl Box Set stands 3.75” tall and comes packaged in a full color window box perfect for display. Fans can pre-order this exciting new Star Wars 2 pack now at Entertainment Earth for $14.99 here.